March 31, 2018, Thekchen Chöling, Dharamsala, HP, India – The courtyard of the Tsuglagkhang, the Main Tibetan Temple, had been elaborately decorated this morning. The structure of the overhead canopies was decked out in the orange, white and green of the Indian tricolour. The guests who filled the yard waited in anticipation until the gates to his residence opened and His Holiness the Dalai Lama emerged. He walked steadily up the central aisle waving and smiling at well-wishers and occasionally stopping to shake someone’s hand. Reaching the dais below the temple he was introduced to guests and dignitaries and took his seat smiling at the crowd. International Relations Secretary of the Central Tibetan Administration (CTA) and Chair of the ‘Thank You India’ Committee, Sonam Dagpo introduced the occasion. 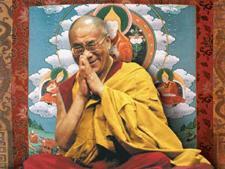 He explained that 31st March marks the day His Holiness reached India in 1959 after fleeing Tibet. Today marked the beginning of a yearlong celebration of that event that will culminate in the sixtieth anniversary next year. In addition to saluting His Holiness, he welcomed the Chief Guest, Minister of State for Culture, Tourism and Civil Aviation, Mahesh Sharma and Guest of Honour, National General Secretary of the Bharatiya Janata Party, Ram Madhav. Artistes of the Tibetan Institute of Performing Arts (TIPA) gave a stirring rendition of the ‘Thank You India’ song. 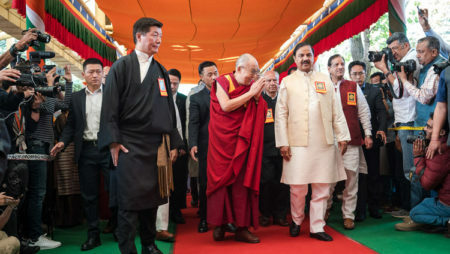 R.K. Khrimey, the National Convener of the Core Group for the Tibetan Cause, an Arunachali, reported that when the Sikyong, Dr Lobsang Sangay told him of plans for this celebration he hatched the idea of a celebratory peace march. His idea was to retrace His Holiness steps from where he crossed the border down to Tawang and so forth. He entertained the crowd with tales of the passes they climbed and descended and of people and miraculous trees they met on the way. Invited to felicitate Naren Chandra Das, the sole known survivor of the seven Assam Rifles personnel who received him at the Indian border in 1959, His Holiness embraced the elderly man. Next, he launched a new book by Sonam Wangchuk Shakspo entitled ‘Kushok Bakula Rinpoche: the Architect of Modern Ladakh’. Members of TIPA gave an impressive performance of Bharatanatyam, an Indian classical dance traditionally presented only by women. Speaker of the Tibetan Parliament in Exile, Ven Khenpo Sonam Tenphel, spoke next. He recollected that His Holiness received a message of welcome to India from Prime Minister Nehru when he reached the border in 1959. Shortly afterwards in Mussoorie he convened his government-in-exile. 1960 saw the beginnings of democratization and the first Tibetan parliament in exile, followed, in 1963, by a new draft Tibetan constitution. His Holiness personally oversaw the founding of administrative departments and the setting up of settlements and schools. His vision was fulfilled with the kind support of the government and people of India. This kindness reflected what veteran Indian politician Moraji Desai described as the unique connection between the Indian and Tibetan people. The Speaker concluded with thanks to India for everything she has done for Tibetans. Tibetan singer Passang Dolma charmed the crowd with her own composition, ‘Ae Hind Tujko Salam’. After TIPA had performed a dance drawn from local Gaddi traditions, Sikyong Dr Lobsang Sangay addressed the gathering in Tibetan and English. He noted that this is the beginning of the sixtieth year since His Holiness left Lhasa, capital of Tibet. It’s the sixtieth year since the illegal occupation of Tibet by Chinese communist forces, which has resulted in the loss of so many Tibetan lives. Of late this has included those who have set themselves on fire. It is also the sixtieth year since the start of the wholesale exploitation of Tibet’s natural resources. His Holiness presented him with a ‘Thank You India’ memento. Sikyong Dr Lobsang Sangay then made the same gesture to the other guests and dignitaries on the stage. Taking his place at the podium, His Holiness began to address the gathering. “As usual I’d like to greet you all as my brothers and sisters. We regularly pray for the happiness of all sentient beings, but if we really mean what we say, we need to remember that we are all the same in being human. “I fled Tibet under difficult circumstances and the time since has been a mixture of happiness and sadness. When we arrived we had no idea what was going to happen to us. Today, nearly 60 years later we have a clearer idea of what the future may hold. Others who have spoken before me have already mentioned the special relations between India and Tibet. We regard ourselves as students and Indians as our gurus. We think of India with respect and admiration as the Land of the Noble Ones. There is a strong bond between us. “Our culture in Tibet was based on what we learned from the masters of Nalanda, such as Shantarakshita. Under his guidance we translated the words of the Buddha into the hundred or so volumes of the Kangyur and the exegetical treatises of subsequent Indian masters into the more than two hundred volumes of the Tengyur. “When I think about the five major and the five minor sciences, I realise how important among them are logic and epistemology. We need to be sceptical rather than succumbing to blind faith. The Buddha himself advised his followers not to accept what he said at face value, but to examine it thoroughly as a goldsmith tests gold. Nalanda masters followed this approach—using reason and logic in the search for truth. “Today, scientists tell us that basic human nature is compassionate. So why do we create so many problems for ourselves? When we have a clearer understanding of the workings of our minds and emotions and we see what disturbs and what calms our minds, we can see how to live a more peaceful life. This is why I believe that what the great Indian masters of the past taught remains relevant today. Much of this ancient Indian knowledge has been neglected. However, having extracted its essence from the literature I mentioned, we can examine and employ it in an academic way. This, based on what we have kept alive, is what we would like to give back and revive in India. “To make the best use of our remarkable human brains the logic, philosophy and psychology of ancient India are invaluable. For us to make such a contribution to the greater good of humanity is an opportunity to transform adversity into benefit. We’ve lived nearly sixty years in exile, but we haven’t been wasting our time and the spirit of our brothers and sisters in Tibet has remained strong. “When Tibet was a powerful independent country in the past, our strength of spirit was matched by our sense of unity. Today, wherever Tibetans live we aspire in the same way to keep our culture and language alive. Not that this is any ground for complacency. We need to keep up our efforts to uncover our shortcomings and learn where we can improve. Following TIPA’s moving performance of a song and dance representing the unity of the people of the three provinces of Tibet, Information Secretary Dhardon Sharling offered a vote of thanks. A light vegetarian thali was distributed and all the guests, including His Holiness, ate lunch together. Then, taking his time to interact with guests, friends and well-wishers on the way, His Holiness walked unhurriedly back to the gates of his residence.